The police handcuffed the sixteen year-old student across the still healing cut on her wrist. They marched her out of the building like a criminal, hands secured behind her back with one officer leading and a second following. They pushed her head down and tipped her into the back of their squad car. She slunk low in the seat and buried her face, hot with tears, in the shoulder of her school uniform, while students and faculty gaped and whispered non-truths. The cruiser pulled out and eased its way around the cars parents and visitors illegally parked in the school’s fire lane then drove off to, bystanders assumed, the county jail. Her arrest was gossip du jour. Rumours of how she had attacked another student, or was it a teacher, no it was an administrator, spread through the student body faster than leaked answers to the biology final. Faculty whispered in the hallways about the man, no woman, I heard middle schooler, she mugged. Around the coffee pot and antiquated, turn-dial microwave the coaches brought up gang initiations and revenge attacks. No one considered her in all this: was she safe, had she been assaulted, was she lost, afraid, or hurting? After all, she was the one in handcuffs. Fact: her mother died in a car accident last summer. Fact: her father is absent. Fact: she was sent to live with her aunt and uncle to be raised with her cousins. Fact: she was bisexual and, though supported by her mother, her guardians insisted she was not. Fact: she was self-harming as a coping strategy. She was my student and an attendee of our LGBTQ support group. Things for her had, as they say in the Dark Tower series, gone 19. In less than a year she had been ripped from a relatively happy, C-average life and dumped in one that became too real too fast. She told me some of her struggles in fragments and bits over the course of three quarters. Like a child cupping a butterfly with a torn wing, she held her life out and, without words, begged for help. I had pieced together the fragments and recommended her for a student health and support program. I was not aware of the cutting, but I am not surprised. It is a coping strategy relied on by teenage girls (and some boys) when life has numbed them. The school nurse discovered scars and a still healing slash (evidence the cuts were deep), when she asked for an ice pack (the only treatment schools can offer). The stark reality of her situation is antithesis to the, now, pernicious rumours. After the counsellor learned of her scarred wrist, administration acted to get her the support she needed. Their solution involved handcuffing by the police and a squad car ride to the local mental health clinic because administration feared her cutting and sexuality indicated a threat to other people. The administrators and the police assessed the situation without considering how she quietly waited for them in the guidance office or how she complied with all of their instructions. They paraded her outside the school and into the squad car like a criminal. They made her the topic of insipid gossip among students, faculty, and staff. They humiliated and stigmatised a girl struggling with depression and self-worth issues and, if she comes back, she will face the consequences of their rash and foolish decisions. I scheduled a meeting with the counsellors and administrative staff responsible for this egregious treatment where I questioned their motives and decisions. They defended their actions based on her history as a cutter and as a bisexual. One of the administrators said, “The girl isn’t normal and that’s dangerous.” I asked why they had her arrested in order to get her to the clinic instead of by ambulance or in the care of the school’s Pupil Personnel Worker. They claimed she was a potential threat to the students and faculty and, when I pushed for an explanation, they doubled-down on their bigotry stating, “girls like that are a threat to the emotional well-being of students and the appropriate social climate of the school.” I had more questions, but they ended the meeting with a curt dismissal. Administration is right about one thing: there is a threat. But I disagree with their assessment of it. The threat is not from the sixteen year-old girl in desperate need of better world but against her. It is a threat levied by a school system more interested in maintaining the status quo than helping emotionally scarred children. They threaten our ability to recognise the victims. Their threat violates children’s dignity and castrates our compassion. As teachers, as parents, as friends, and as sensitive human beings, we need to stand against this. We need to practice just-action as a form of radical love. We need to raise and shelter those who cannot defend themselves. We need to be better. I suspect I know who posted this to me. I think it is interesting that they should have such a violent reaction to my decrying of violence against another human being. Clearly they have had some difficult experiences in the education system. I would like to state for the record that the teacher who was beaten was a fifty-six year-old woman with an unblemished record. She has been teaching for thirty years. She is a sweet lady who bends backwards to help her students. The thing she did wrong? She told the student to put her phone away during class. That’s all. She didn’t try to take it, she didn’t hang it up or power it down, which I know some teachers do. She just said, you need to put the phone away. The student who attacked her was kicked out of two other schools in the county for disruptive and violent behaviour and was on probation for assaulting a police officer while being disciplined at her previous school. Anyone who has the guts to say a person deserves being beaten to the point of hospitalisation, is in serious need of therapy. Clearly, there are unresolved issues that need to be addressed. 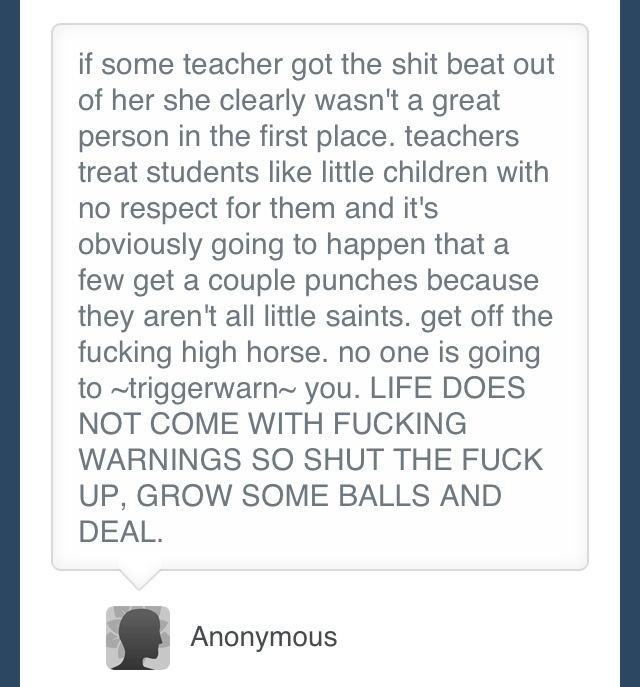 Further, this mentality that teachers “deserve it” is part of the problem with the American education system. It is never the fault of administration for a failure to support teachers, parents for failing to instil an appreciation of hard work and moral behaviour, or—goddess forbid—the student’s failure to own their behaviour and accept responsibility for their actions. This “Anon’s” response is further proof of the degradation of personal responsibility and the general lack of autonomy and morality that is plaguing our culture.